Batch cooking is one of the most delicious gifts you can give yourself. At the end of a long day, you’re tired and don’t feel like even thinking about what to eat. You open the fridge and see the gift you’ve made for yourself. 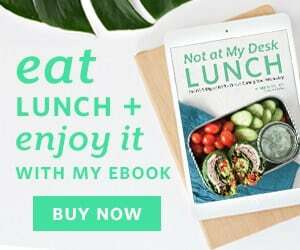 All you need to do is reheat and eat a nutritious and satisfying meal. Some of my favorite things to cook for batch meals are stuffed veggies. They’re great portion control and also easy to quickly divide for a few meals. I made stuffed bell peppers a few weeks back and fell in love with the soft filling and the slight crunch of the bell pepper. 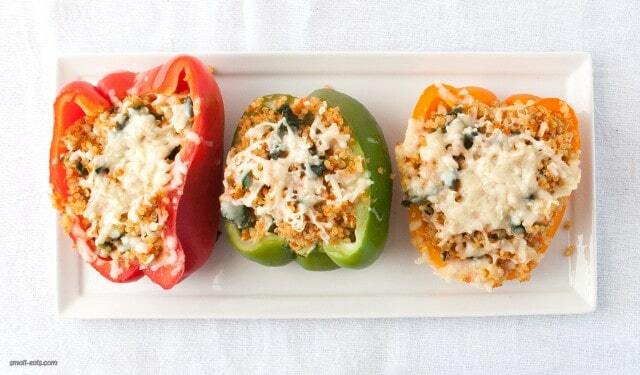 I’ve made stuffed bell peppers on the blog before, but these are another fun take. These have a summer/fall transitional filling of quinoa, collard greens, zucchini, and carrots. To get the most amount of carrots (since I always seem to have carrots in my fridge, and also why not? ), I threw a few, along with some cloves of garlic, into my food processor and pulsed them up into a course meal. If you’re cutting back on grains or pseudograins (since quinoa is a pseudograin) for whatever reason, swap the quinoa out for some cauliflower rice. You can add the cauliflower into the food processor with the carrots and garlic and have that ready to go in minutes. To top these stuffed peppers, I sprinkled some Kerrygold Aged Cheddar on top. The cheese adds a little bit a saltiness and a little extra something that’s especially good at the end of a long day. The Aged Cheddar, like all Kerrygold’s products, is made from milk from grass-fed cows, meaning a better tasting and higher quality cheese. Feel free to double or reduce this recipe as needed for the amount of days you want them or the amount of people at your table. If you have leftover filling (I usually do) throw that on top of salad or use it as a side dish with some beans or animal protein for another meal. This post was sponsored by Kerrygold. I was compensated with free product. All thoughts and opinions are, and always will be, my own. Preheat oven to 375. 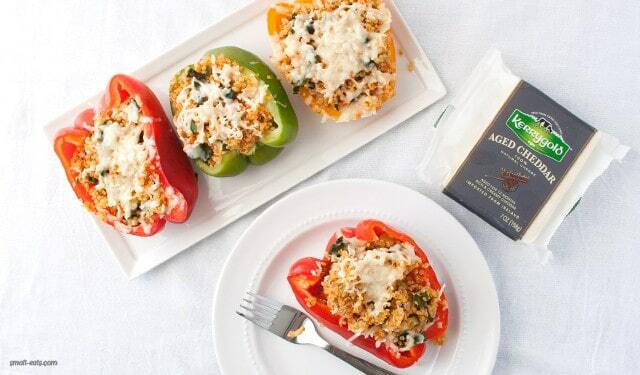 Arrange bell pepper halves on a foil lined baking sheet or foil-lined baking dish (eight halves will fit comfortably in a 13 x 9” dish). Cook quinoa on stovetop or in a rice cooker per package instructions with 3 cups of water. When done, place in large mixing bowl to cool. In a food processor, combine carrots and garlic cloves and pulse until the vegetables are a course, rice-like consistency. In a sauté pan, bring 1-2 tsp of olive oil to medium heat. Add carrot and garlic mixture and cook for 2-3 minutes. Add zucchini and collard greens and cook until zucchinis are slightly translucent and collard is more wilted, about 5-10 minutes. Remove from heat and carefully dish mixture into the mixing bowl with quinoa in it. Add cumin, cayenne, salt and lemon juice to mixture and stir to combine, adjusting seasonings to your taste. 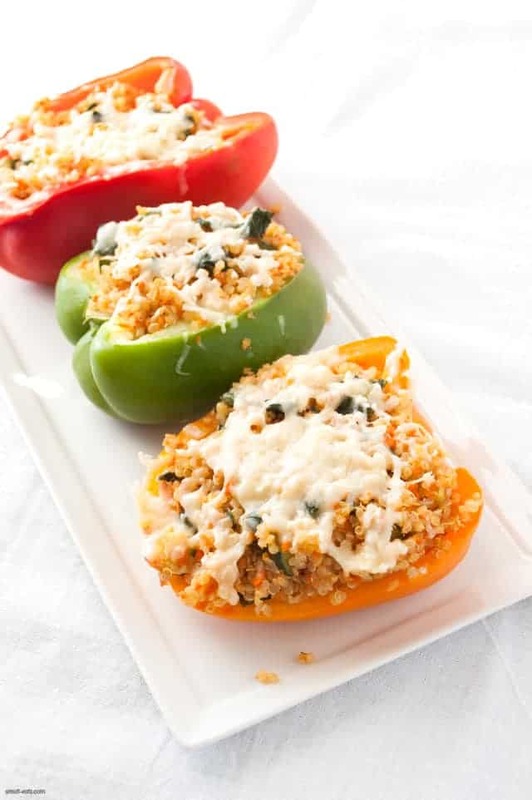 Spoon the filling into the bell peppers and top with grated Kerrygold. Cover with foil and bake for 25-30 minutes.